Healthy people usually are not burdened with too much food, daily, sometimes in a fast way they enter quite sufficient amount of food in their body. However, for those who are struggling with cancer - daily meals are a real feat, while their food intake often is a true torture. The cancer cells are not the only thing that weakens their immune system. There is a treatment, usually chemotherapy, which in addition to malignant cells usually kills those healthy, which further complicates the job of the immune system of cancer patients. Because of the above, diet after chemotherapy with radiation is very important for these patients and their full recovery. The article reveals how to put an end to the most common problems that cause these forms of treatment. People with cancer often have the impression that the food has a different smell or taste, they have difficulty in swallowing, nausea and vomiting usually goes hand in hand with painstaking therapy, just like constipation or diarrhoea. Loss of appetite is almost a normal occurrence during treatment, there are also possible sudden increases, or decreases in body weight. With our little guide, find out what kind of diet after chemotherapy is recommended and how you can mitigate the effects in this treatment, while strengthen your immune system. Many people who are undergoing chemotherapy complain of altered odour or flavour of food, especially bitter, sweet and salty - it happens that all foods are very similar and that they hardly differ, but also they feel uneasy metallic taste in the mouth. All this is the result of taking a very strong and aggressive drugs. Normal taste of food is back three to four weeks after completion of treatment with chemotherapy. 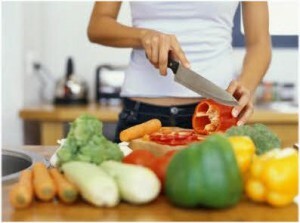 If you feel that the taste of food is wrong, forget about red meat that patients with cancer certainly should not eat. Nutrition after chemotherapy must be adapted to the detail, instead of red eat boil or steamed poultry meat (roast is not recommended, especially not on the grill) and yogurt drink or lemonade. Also, try to eat something spicy food, but avoid industrial spice mixtures, but give food special taste using turmeric, parsley, garlic, hot peppers or ginger. Nausea, vomiting, diarrhoea or constipation can cause loss of appetite, or the willingness of food, especially if accompanied by depression or stress, which often becomes faithful companions of cancer. If you lose your appetite during chemotherapy treatment, immediately after therapy select high calorie and healthy food. Nutrition after chemotherapy involves the following foods: avocados, nuts, dried fruits or vegetables, preferably in combination with hummus. Between meals, drink fruit smoothies. Remember to make food attractive - hungry eyes are the first step towards opening the appetite. Use lemon slices, parsley leaf, cherry tomatoes or olives for decoration - not only will it give a nice appearance but food will strengthen the body. Fragrances – let’s say of baked bread - can also stimulate appetite. Mouth sores and difficulty in swallowing can also be one of the consequences of chemotherapy. Therefore, the diet after chemotherapy should be based on low, mixed food, such as mashed potatoes or apples. Both are excellent choices, with sufficient fluid intake on a daily basis. If you get a blender, you can create a variety of healthy drinks, fruit and vegetables, which are great fighters against cancer, and in liquid form it not so difficult to swallow. In doing so, instead of water, add goat milk or chicken broth to increase intake of much needed calories. During chemotherapy, and after it, recommended is the juice of citrus fruits, and if you do not like it, try drinks from apples, cranberries or raisins. Nausea is normal during chemotherapy. You should avoid foods with strong odours and tastes, you should not force yourself to eat but take several small meals during the day. Peach and other soft fruits with slight taste can be a good choice, while fluid, in addition to water, apple juice or cranberry one is recommended. In addition, the diet after chemotherapy should also contain eggs, so it is advisable to eat them hard-boiled. Be sure to prepare toast, rice or pasta. Instead of fried meat, eat some piece of broiled chicken, best in combination with vegetables, and nibble on nuts, which are full of selenium and vitamin E.
Chicken soup is also recommended, but to ensure enough fluid in the body, drink mint or ginger tea. Vomiting in many cases can be traced to unpleasant nausea. Solve it by starting to drink small amounts of clear liquids, like water, chicken broth, apple juice or cranberry, ginger tea and the like. First, take a tablespoon of liquid every ten minutes, then two tablespoons every 20, and then three tablespoons each half hour. When you see that your body accepts fluids, go to light food - eat mashed potatoes or cereals, and drink fruit smoothies, yogurt and soy milk. Nutrition after chemotherapy includes foods rich in potassium - such as bananas, tomatoes, apricots, potatoes and orange juice. If constipation is one of the side effects of treatment, diet after chemotherapy means to incorporate more fibres - beans, chick peas and other legumes, grains and fresh fruits and vegetables will be your best allies. However, make sure: if you do not consume foods rich in fibre, you should do so gradually, as a sharp intake of fibre in the body can cause the opposite effect and worsen the condition. Also, keep in mind that eating fibre without consuming sufficient amounts of fluid will not work against constipation, so a day, drink at least six to eight glasses of non-carbonated mineral water. Some patients have constipation but during chemotherapy are troubled by diarrhoea. What are the side effects of radiation and how to adjust the diet? As certain foods can alleviate the side effects of chemotherapy, so other food can also make radiation therapy easier. One should avoid alcohol and coffee, drink less tea (except green tea), forget bacon and other meat products, as well as industrially processed juices, while cigarette smoking is strictly forbidden, as it may aggravate the treatment. Purchased canned fish in oil should also be avoided, but if you like fish, you can make yourself a tuna or salmon, which are rich in omega-3 fatty acids and vitamin D, which is a great formula for strengthening weakened immunity. Nutrition after chemotherapy and radiation should be colourful, which is especially true of fruits and vegetables - fresh food is not recommended for patients with cancer in large quantities, so it is best to slightly cook vegetables every time before eating, while the tomatoes should be cooked to order release lycopene. On the other hand, the carrot is best eaten fresh, but instead of red meat, eat chicken without skin, as this will provide much-needed protein, and energy. You can consume them in the body if you eat fish, eggs and legumes. Also, it is important that during radiotherapy you drink plenty of fluids, because the hydration is the best way to neutralize the harmful effects. The optimum daily amount of fluid after radiation therapy is three litres - still water can be a good choice, although hot chicken soup is recommended, as well as freshly squeezed fruit juices. Nutrition after chemotherapy excludes all purchasing industrially processed drinks, because they are full of sugar, which further complicate the treatment, as it feeds cancer cells. On the other hand, make drinks rich in vitamin C – since it has a similar structure to glucose, so instead of feeding cancer cells, it destroys them. Blend two handfuls of fresh blueberries and two sliced ​​bananas. Mix and add the soy milk to achieve the desired consistency. If desired, you can add a little vanilla. Garnish with a few fresh blueberries and serve immediately. Slip into a blender with 35 g of roasted almonds, walnuts, Brazil nuts and hazelnuts. Add a cup of water or coconut or soy milk, two chopped apples, 50 g of raisins, 50 g of berries of your choice. Insert four tablespoons of low-fat yogurt and give it all a good mix. In a blender mix two chopped apples and two chopped pears. Add half a celery, half large cucumber, 85 g of young spinach leaves, a little green salad and half of chopped avocado. Mix everything well and drink immediately. Add to a blender 500 g of watermelon, 250 g of peeled cucumber, 100 g of celery and a tablespoon of freshly squeezed lemon juice. Mix well, pour into glasses and sprinkle with fresh mint and flax seeds.